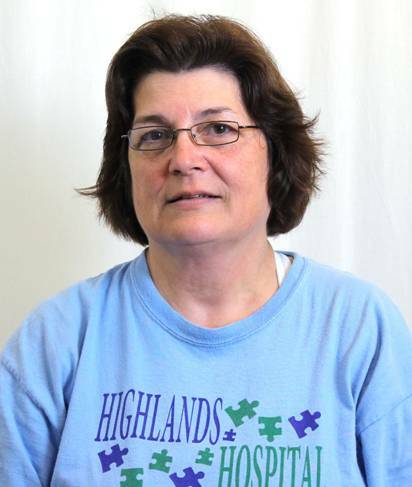 Denise Kerns is a new member of our Online Stores family, starting with the company in February of 2012, but has worked hard to contribute to the shipping department and help out in any way she can. Denise mainly works in the shipping department as a “picker”. These employees need to be able to work quickly and know the warehouse like the back of their hand. Once an order is printed, supervisors divvy up the orders to the pickers so the items can be gathered and shipped out. They must then use their scanning guns to load the order and the items on it with their locations so they know where to get the items for the order. The location is a series of numbers designating what row, bay, shelf and spot on the shelf the item should be located. The pickers then must move throughout the warehouse to find the location of the items and get them ready for shipping. Once they’ve gathered all the items, the put the items and the packing slip in a bin and drop it of on the conveyor belt for the packers to package them up and ship them out to the customers. The pickers must make sure they are scanning each order, and scanning each item they pick, because every time they scan items and enter an amount, their scanning guns are altering the inventory amounts in Stone Edge. These amounts are very important to almost every department in the company, because when the totals get low the items need to be re-ordered, marked out of stock and placed on back-order. If a picker makes a mistake it could cause the inventory to show too many or too little of a product, neither of which is good for the company. Pickers must pick 300 orders per day, and packers must pack 400 orders per day, so hard work is a must. Denise has earned her title of employee of the month because of her extra effort in picking up the extra housekeeping tasks in the absence of a housekeeper. Although this is not her normal task, Denise took the job and worked hard to complete these tasks and still kept a positive attitude while completing the job. Thank you for your positivity, Denise!